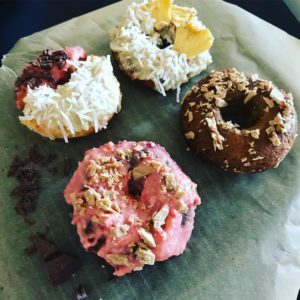 Inspired by the Jewish festival of Chanukah this week, when traditionally oily foods are eaten, I thought I’d take a healthy oil (coconut) and transform it into a healthy donut recipe. These donuts are baked, not fried, and contain no dairy, gluten, or refined sugars. If you’d like to try making them at home, please see below for the recipe. Chanukah is a holiday of miracles – and while you and I may not be aware of them, miracles are happening all around on a daily basis. Add whatever toppings your heart desires to the icing – raw chocolate (keep in the fridge before chopping), shredded coconut and chopped nuts are 3 of my personal favourites!